The United States Coast Guard has been conducting inspections in various locations in the Peoples’ Republic of China and Hong Kong SAR since 1980. U.S. Coast Guard Activities Far East (FEACT) and MIDET Singapore personnel work extensively in China supporting the U.S. Coast Guard’s Marine Safety, Marine Security, Search & Rescue and International Engagement Missions. 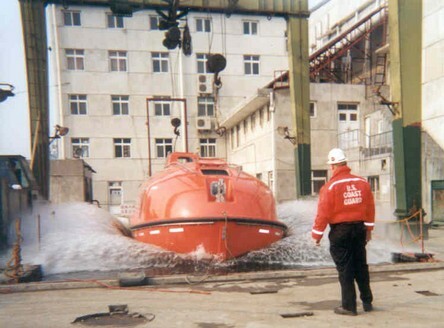 The majority of our work is under the auspices of the Marine Safety program with vessel and lifesaving equipment inspections in Qingdao, Nantong, Dalian and Zhenjiang. 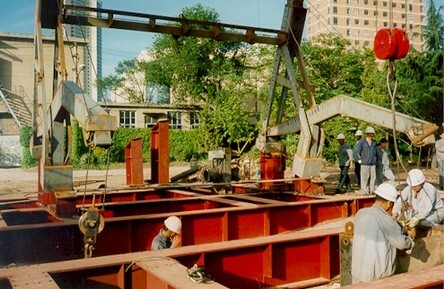 In 2002, inspectors conducted two U.S. tank vessel reflag projects and four deep draft drydock exams. In addition, we monitor the construction of Coast Guard approved lifeboats and davits that are fabricated in China. We conducted nine lifesaving equipment inspection approvals at five different facilities resulting in Coast Guard approval of 16 lifeboats, three rescue boats, 23 davits and 34 winches. All this equipment will be installed on Coast Guard certified commercial and certificated military support vessels. United States law requires all life saving equipment used on Coast Guard certificated vessels to be Coast Guard approved. Lifeboats, davits and winches constructed at Beihai Shipyard and at Behai’s davit fabrication facilities in Qingdao have to go through a detailed inspection process prior to being approved. FEACT conducts these inspections to ensure the equipment is being constructed to the standards set by the Coast Guard and the International Maritime Organization. In 2002, FEACT/MIDET inspectors averaged one China trip per month. 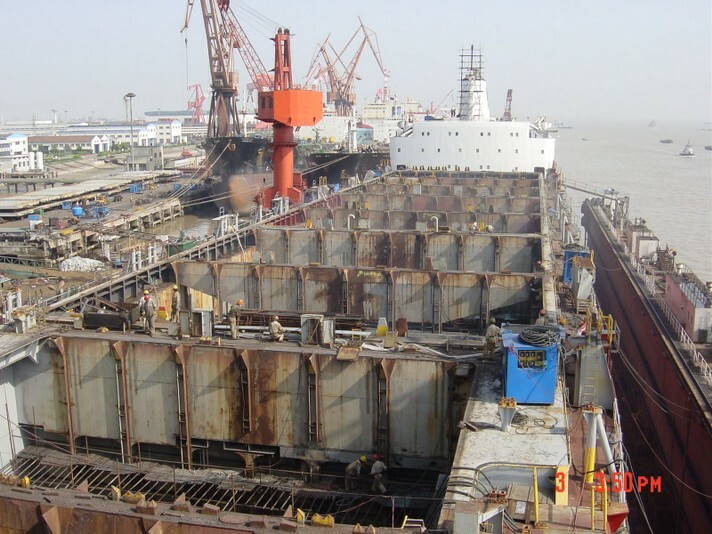 With the current world economic climate, conducting U.S. vessel repair and hull exams in the China has its advantages due to the inexpensive cost of materials and labor. With cost savings driving most marine industries we are expecting a 70 % increase in China shipyard contracts for Coast Guard certificated vessels and reflag projects in 2003. According to the World Trade Organization (WTO), China is considered one of the fastest growing economies in the world. The opening up of markets will fuel increased shipping to/from China and the US and will make Chinese shipyards more competitive for vessel construction and repair contracts. Under our Maritime Security and International Engagement missions we have provided presentations to the Hong Kong Shipowners Association and Chinese Classification Societies. Through these venues we are able to liaise with quality shipping companies. This is very important in facilitating foreign vessel arrivals into US ports with the Coast Guard’s heightened state of maritime domain awareness. In addition, we have provided training and inspection aids on the Coast Guard’s Port State Control, Inspection and Investigation Programs for two Chinese Port State Control Officers who were trained by FEACT personnel through the International Maritime Organization’s Technical Exchange Program. Search and Rescue (SAR) specialists from the Coast Guard, Air Force and Navy participate in the Hong Kong Search and Rescue Exercise (SAREX). This is the largest SAREX of its kind in Asia and includes participants from throughout Asia. The Coast Guard routinely participates with rescue swimmers and SAR Controllers., and a High Endurance Cutter or C-130 aircraft in alternating years. The Coast Guard is a key player in this important Hong Kong Civil Aviation Department event. Coast Guard aircraft and crew support is provided by Air Station Barbers Point in Honolulu, Hawaii. SAR Controllers are provided by the USAF and USCG staffed Joint Rescue Coordination Center Honolulu. Pacific theatre DoD assets have come from as far as Alaska to join in the exercise. Work in China is a highlight for all Coast Guard personnel. It requires a broad spectrum of skills; the ability to communicate with foreign shipyard workers, the skills to recognize and react in challenging shipyard condition and, most importantly, the ability to appreciate our "Chinese Fortune" to travel in one of the world’s most ancient and interesting cultures.